You all know I've been on the hunt for a thicker hair milk or a hair cream with little to no glycerin in it. I came across a Sweet Nature by Eddie review that Good Hair Mart owner, Monique aka CoilsKinksCurls on Youtube, did on some of their products. One of them was the Journey Hair Milk. After hearing her review and seeing that vegetable glycerin was the very last ingredient on the list sparked my interest. So much so, that right after I saw the vid, I bopped on over to http://www.fabulousblackwoman.com/ and got the 4oz size to give it a try. Excuse the crinkles. I took the pic after I have used it quite a few times. Lol. You know I keep my reviews pretty short and to the point. In summary: I like it. The customer service was great and the product is pretty darn moisturizing. I really feel like my hair is ABSORBING it and it's not just sitting on top of my hair, building up. It makes my koils feel soooo soft, hydrated and fluffy. It makes my hair feel great, almost instantly. I also tried it as a leave in sealing with castor oil and did a braid out with the same soft and fluffy results. I luvd it! I also luv its consistency. It's thick and creamy and smells heavenly, like cherry vanilla. 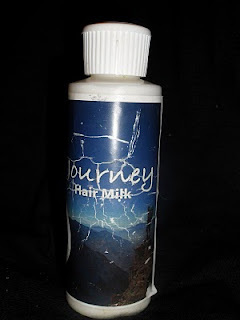 I started falling out of luv with my old hair milk by Karen's Body Beautiful b/c what I luv'd about it back in my TWA days: its "wet"/watery, thin consistency; I now don't like about it anymore. The things veteran naturals don't tell you (I should do a post about this) is that as your hair grows out, sometimes it can grow out of certain products that used to work wonders for your hair as well. My twa luv'd the KBB Hair Milk but now that it's no longer a TWA, no mas. So now I'm rocking with this product and it's working. The 4oz bottle ran me $8 so the price is very reasonable. Once I run out, I will more than likely re-buy. I just bought this last night, so excited for it!!! I have been meaning to try this. All of her other products are good. And Im using up my last bottle of kbb hair milk, its way too watery for my hair. I will probably mix it with some shea butter to thicken it up some. Great review! I might have to try this now that it's getting warmer and I'm starting to wear my hair out. Too bad I have so many other products (3 tubs of afroveda butters) that I have to use up! And yes, it's very true that your hair needs often change as it grows. That's usually because the hair at the ends is more fragile/dry (it's been around longer) and you often change your hair routine (less wash and go's, etc.). I'm currently trying to re-discover my "out" hair groove since this is the first week I've worn it out since the fall and it's not behaving the way it was before! Yup , I like it as well . Its not thin either. Its very creamy! Moni, I hope you will soon rediscover your hair's "out" groove. Lol. I'm sure you will. Your hair is probably even bigger and better! Brandiss, I never thought to add shea butter to the KBB Milk to thicken it up. I still have a lil left but left it for dead. Lol. I'm def going to try this. Great idea! Thank you for this post! 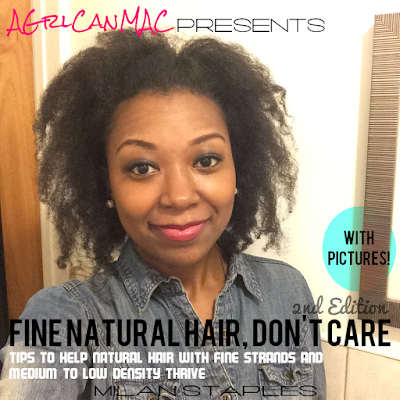 I'm always looking for new and healthy natural products to use in my hair. And I agree, the longer you hair is, the thicker the products that it needs. You have a great site by the way!